Watch an all new episode of One on One with Alex Ruggieri featuring Mike Yager. 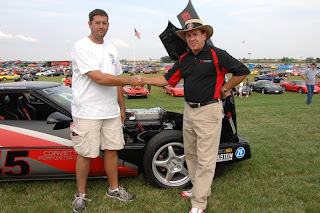 Mike Yager began his business when as a young man he borrowed $500.00 to purchase some patches and T-shirts which he had planned to sell at a Corvette car show. The rest as they say is history. Today Mike is the largest supplier of Corvette and Volkswagon accessories and supplies. He employs a couple of hundred people and just opened his first office in China. I really enjoy Mike's contagious attitude. He really lights up a room with his smile. The thing is this guy is for real. Its not hype. He carries his passion with him and he loves his business as much as he loves life! I get a kick out of that. Click here to watch!